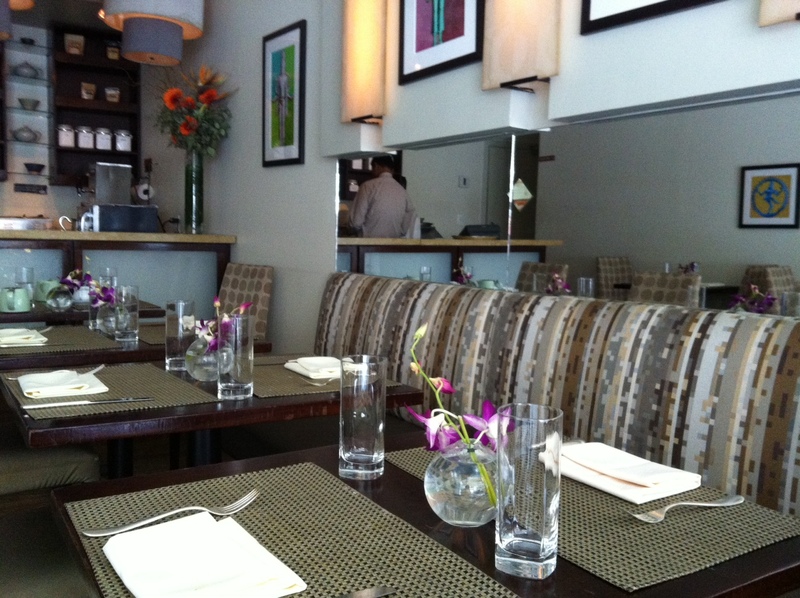 Last week I took the train to 23rd Street to meet Jee for afternoon tea at the Tamarind Tea Room. I had planned to walk from my apartment to the tea room, before I knew it would one of the hottest days of the summer! The day's heat influenced my choice of tea. From the menu of 16 teas, I selected the Hibiscus Elder. The first cup was refreshing and it would have been more so iced. My second cup was cloyingly sweet. I had overstepped the tea. (Another contributing factor could have been that the tea basket was packed with tea.). The tea pot is from For Life - I really like the company's products. The tea room is small but the mirrors above the banquet seating enlarge the space. The small bouquets on each table are elegant. The food is not served on a tray. 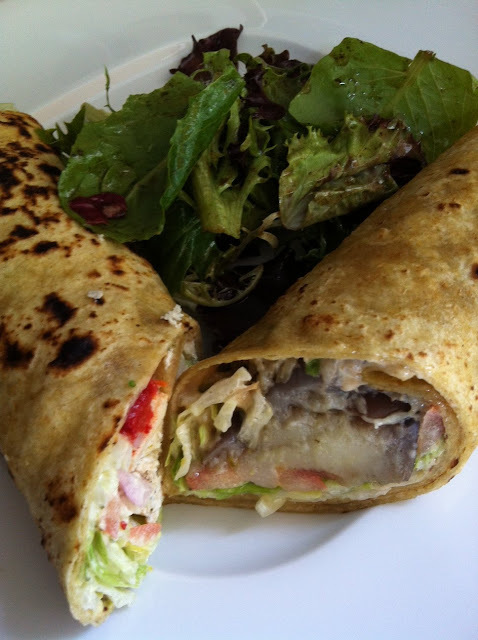 The savory option is a choice of a wrap. Since we ordered Tea for Two, our sandwiches were halved and we each received a half of each sandwich. I ordered the eggplant and Jee chose the chicken. Our gracious server prepared for me an additional vegetarian sandwich - a curried Indian cheese sandwich. I preferred the cheese to the eggplant but Rotea gave the (leftover) eggplant wrap high marks. The sweet option is a choice of rice pudding or Payasam, a pudding of vermicelli noodles flavored with saffron and cardamom. I ordered the latter though both were delicious (I am a big fan of condensed milk). The puddings were served with two cookies - lentil short bread and caraway seed - as well as a raspberry-filled pastry. These were good, too. Next time I would order the mushroom sandwich which comes with a tamarind sauce (the namesake sauce perhaps) or maybe the salmon, if it's wild caught. And since it is an Indian tea room, a Darjeeling or Assam seems like a good bet, too. 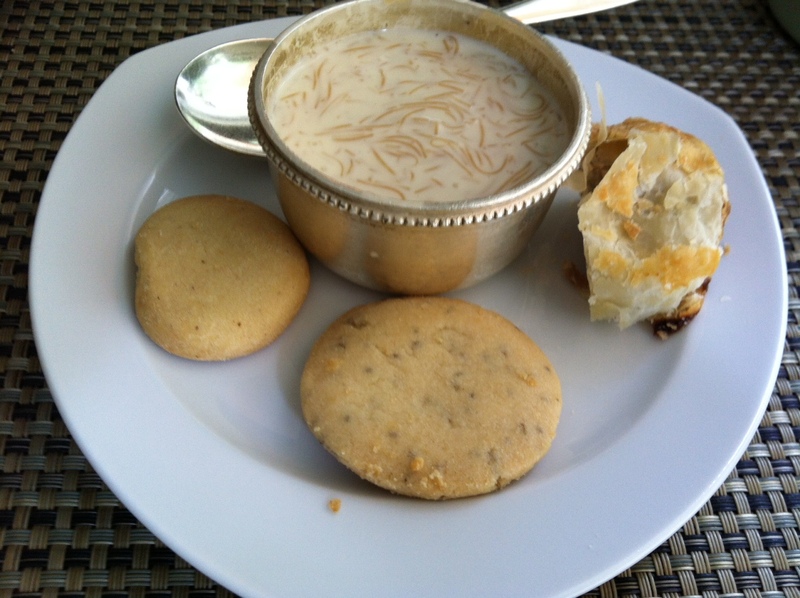 You can read Jee's review of Tamarind Tea Room's afternoon tea at Oh How Civilized. Afternoon tea at this tea room has also been reviewed by Sara at Tea Happiness and by Kathy YL Chan for Serious Eats. P.S. I called and asked about the brand of tea served in the tea room and was told the teas are imported from India.